Well it’s 2011, and we’re still talking about Vampires. My apologies if you’re not a fan, but I spotted this just before the holidays and didn’t post it (owing to shipping times / availability) during the holiday hiatus I imposed. The good news is, I *have* found this specific product on Amazon.ca for just $12, so perhaps it was worth the wait. The item is Vampire Paper Dolls. First, since my boyfriend had no clue what paper dolls are, you basically have a character made of a thicker paper or cardboard, and then you cut out a bunch of clothes made of paper with little tabs used to fold over the character so they are in effect, wearing the costumes you’ve cut out. These days, paper dolls are probably lost on most little children – and the few companies out there still producing these goodies are probably aware of that. The range of dolls I saw included famous ballet costumes, Marilyn Monroe, the Obamas, and famous movie pirates. Realistically you could actually just buy a paper doll book and keep it as a more of a coffee table book – the artwork is exquisite and there is a little caption under each costume that tells you where this vamp or that ballerina is from. Alternatively, break out the scissors and hack away, dressing your paper pals to suit any occasion and propping them up in a window or on your desk for a kitschy yet modern piece of decor. Tom Tierney is the man behind the majority of these collections, so if vampires aren’t your thing, type his name in on Amazon.ca and you’ll come up with dozens of other options. If you are into the vampires, you’ll be pleased to hear the collection comes with a male and female doll, and 29 costumes including heads to transform them into all manners of boy vamps and ghouls. 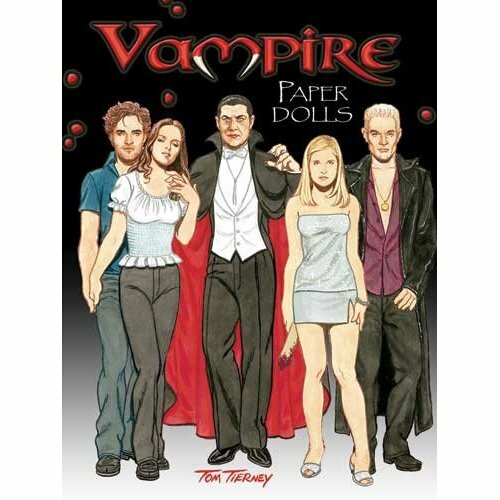 The cover of the book is marginally misleading by putting some of the most modern, recognizable incarnations of vampire pop culture on it – there is one Bill (True Blood) and one Edward (Twilight) doll, and three from Buffy (Angel, Spike, and weirdly – given she isn’t a vampire – Buffy herself), but the majority are more in the vein of Dracula – but with plenty of subtle and blatant differences. Many of the dolls aren’t just standalone costumes, they actually include another character – whether a drained maiden in their arms or the reluctant body of Bella Swan being encased by Edward Cullen. Paper dolls like these are a cute gift for a coworker or friend that you know has a relative interest in one of the topics Tom Tierney covers. They’re totally unexpected, have a fun retro flavour, allow you to give away a toy and not feel weird about it, plus they give the giftee a few options with how to display their new goods, all at a fantastic price.